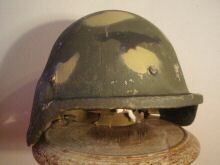 Half-steel half-composite helmet, with the outside shell made of steel and inside shell of composite. 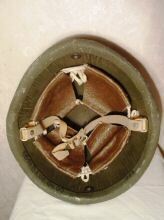 There are several models of the liner, either with 2-point or 3-point chinstrap. 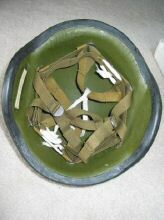 These helmets have seen limited usage, mostly in 1990s in international missions and exercises. 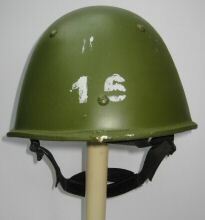 Another name is 6B14, which is designation by the helmet manufacturer, NII Stali. 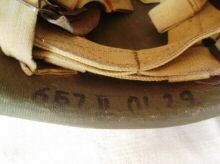 It is seen written on the helmet brim. 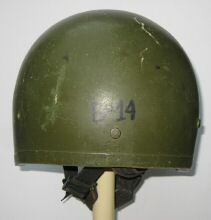 "Russian 6B14 (aka SSh-68M) steel/composite helmet. 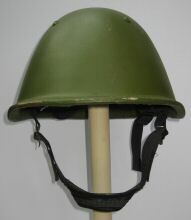 It is a later modification of SSh-68M helmet. 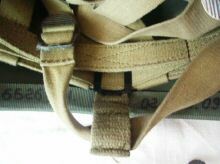 This modification was manufactured by NII Stali around 2002-2006 and then replaced by its 6B26/27/28 composite line. 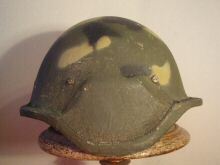 It has got a 3-point chinstrap, contrary to earlier 2-point chinstrap. 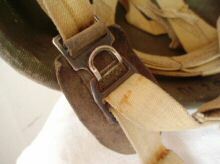 Leather chinstrap was replaced by textile one, metal buckles were replaced by plastic and a plastic chincup was added. Most commonly seen is the brown colour liner, but one could also find more rare black colour liners." 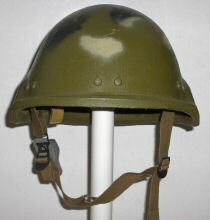 RUSSIAN EXPERIMENTAL (?) COMPOSITE - is almost certainly the same model as the previous entry above. 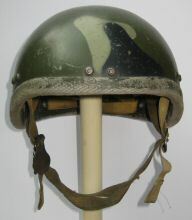 Ssh68N steel and composite combination helmet. 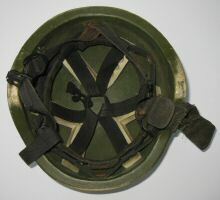 "Green outer steel shell with inner lined with composite material and a green cloth band wraps up around the outer covering the steel/compo join. 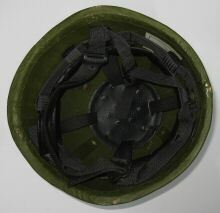 Black nylon-type webbing liner with large circular perforated crown pad and black leather sweatband. 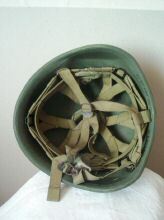 Adjustable nape straps and split-chin cup. Makers label to rear left. 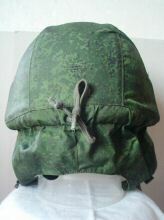 Forest ("Les") pattern camo cover. 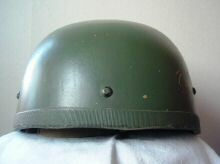 These helmets are similar to the Ssh-68M in construction but are used by internal forces whilst the 68M (see above) are used by the Army." 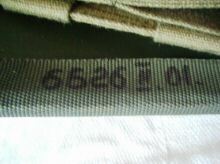 "Titanium and composite hybrid, part of the 6B6-6B7 program. 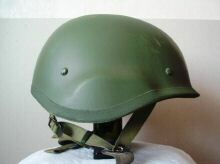 Its developer was NII Stali who also made the Altyn and K6-3 helmets. 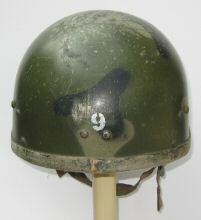 Unlike the 6B7 (an all-composite helmet), the 6B6 has a combination of titanium and composite material. 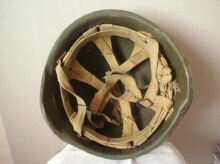 The outer shell is 3mm titanium and inner shell is made of aramid. 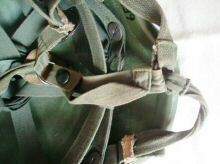 Development of 6B6 took place in 90s and it was accepted by the MOD in 2000 for general use. 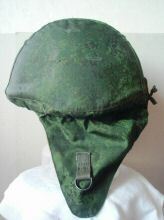 Only limited numbers of these saw service as they were high cost items to produce and as a result this is one of the rarer Russian army helmets. 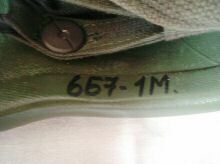 Weight is 1.6kg"
"The official designation is P7 ("?7" in cyrillic alphabet), or 6B7 ("6?7" in cyrillic alphabet). The latter is the designation by the developer, NII Stali. 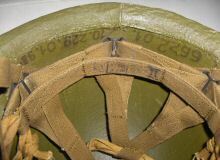 One can see this written by hand near this helmet rim. 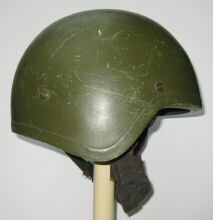 '6B7' is the first generation Russian composite helmet, produced since mid- or late 90s and up until today. 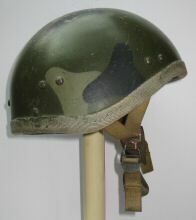 Although NII Stali is quite well known for its combined steel/composite helmets, the first full composite was developed rather late, mostly due to lack of funds to manufacture composite helmets in large numbers. 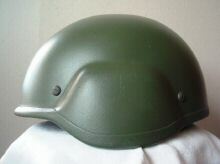 There are two producers of this helmet - NII Stali and ArmoKom. 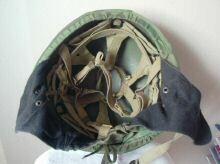 The main material is a mix of aramid polymers. 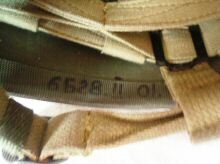 Besides the main model, there are at least two modifications by ArmoKom that have designation 6B7-1 ("6?7-1") and 6B7-1M ("6?7-1?"). 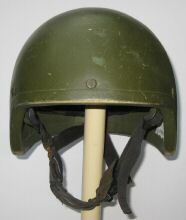 In the field trials, some modifications were proposed. 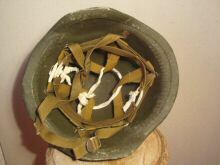 Due to this, one can see some differences in chinstrap and even the shell between modifications. 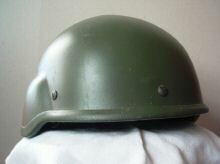 These helmets first started to appear in high readiness units (paras and marines)." 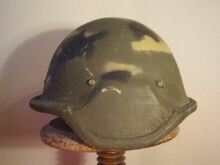 "This strange-shaped helmet is an early modification of 6B7 model. Commercially they are also known as P7. 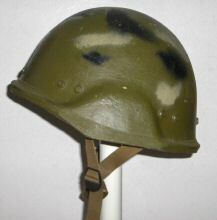 They were issued in limited numbers in the last decade of 20th century. Probably the last action they saw is Second Chechenian war. 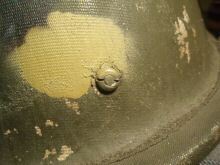 Afterwards they were replaced by newer modifications of 6B7. 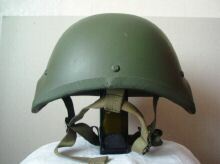 This shape allows using of headphones and its weight seems a bit below most of Western counterparts. 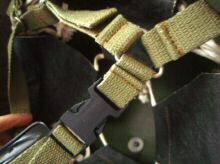 The liner straps and rivets are rather typical for Russian-made products. Overall, it gives an impression of rather early product and somewhat crudely made. 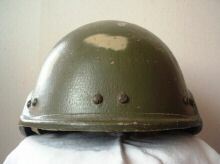 There are no markings but a tiny unreadable ink stamp at left ear. However, that is not a rule since some 6B7s are encountered without it." 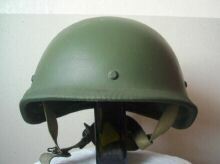 "Here is a standard issue 6B7, made by NII Stali. 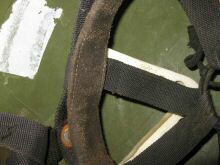 Note the double rivets holding the liner. Also note the rim here is less flat against first 6B7 showed by Adrian Blake. 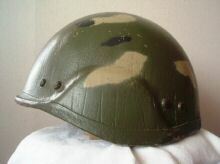 His helmet is made earlier, when some variances were still encountered. 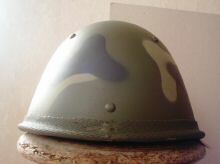 As a standard issue, NII Stali's 6B7 come without covers but with painted camo. Also adding to already said about 6B7 in general, it came out from the "Borit" research program, which was initiated by NII Stali back in late 80s. 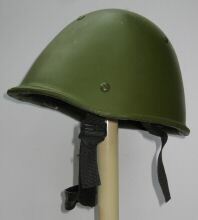 It was started seeking for replacement of SSh-68. 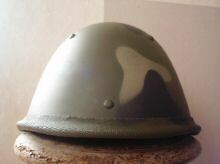 Two helmets were made, titanium 6B6 and composite 6B7. First one was found to be too expensive. The composite program was renamed to Borit-M and led to development of 6B7." 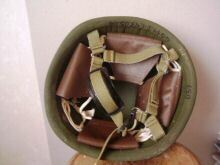 "It is manufactured by Armocom (or Centr Armocom to be precise). 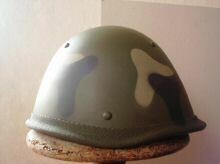 It came as a second step in developing its 6B7-1 helmet. 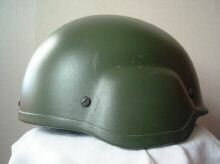 6B7-1M was developed and approved for usage in the Russian army in 2008. 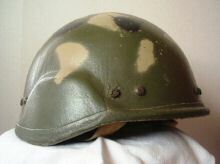 When developing it, designers were trying to walk away from the classic PASGT shape but relying on forms of previous Russian helmets, so that the shape could be easily recognized, avoiding friend/foe identification problem. 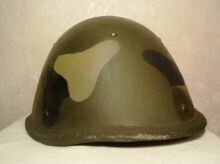 Requirements of wearing warm cap underneath and allowing for usage of headphones were also considered. 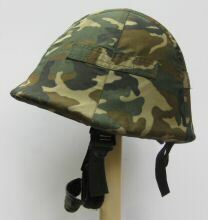 For the hew helmet, a new aramid fabric named "Rusar" was developed. 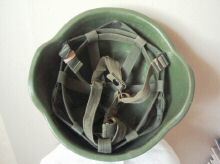 According to Arkocom, it allows useful life of 12 years. 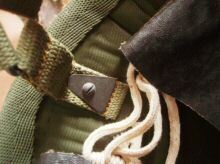 As a result of a new fabric, V50 ballistic protection is not less than 630 m/s which is a bit higher than 620 m/s for 6B27. 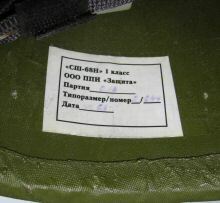 As usual with current Russian composites, it retained low weight - i.e. 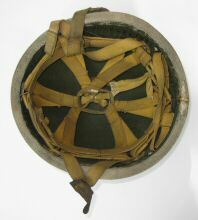 around 1.15-1.25 kg. The producer also claims it does not sink in the water. Liner is quite traditional. 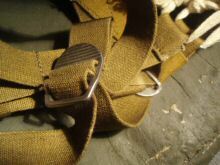 3-point chinstrap with sliding back loop. 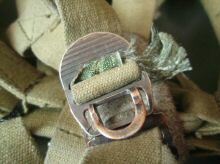 Note different chinstrap fastening than on NII Stali's, here it is a metal clip-on button system. Also washers are different to those of NII Stali. 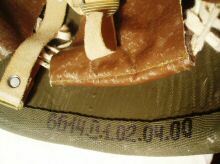 The marking is also a bit different against NII Stali - only model and size on the back rim. The longer marking on the bottom picture is "size up to (and including) 58". 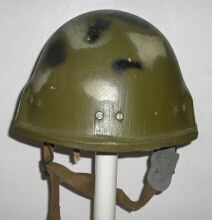 The helmet is aimed at both regular units and the paras, there is no special modification for the latter. 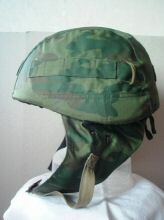 Hence it comes with a para-style helmet cover with earflaps. 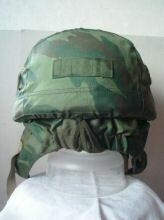 These are made of similar fabric as the main body, unlike the warmer earflaps of 6B28. 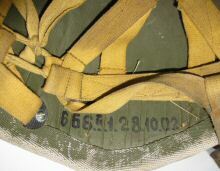 Inside the cover, there is a white stamp "6B7-1M"." 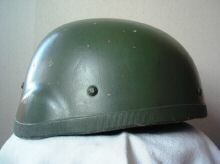 "Russian 6B26, manufactured by NII Stali. 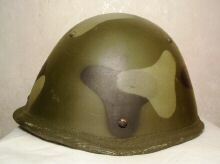 In its helmet line NII Stali has a set of three main army helmets (6B26, 6B27, 6B28) alongside with other helmets. Besides visual differences, these three also have different weight and ballistic protection. 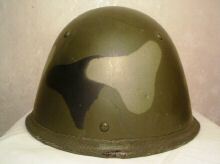 6B26 is a light-weighted version (only 0,95 kg) army helmet, mostly aimed at special operations units (but not paras). 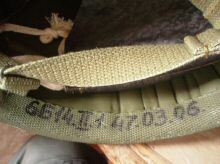 Its ballistic protection is V50 = 580 m/s. 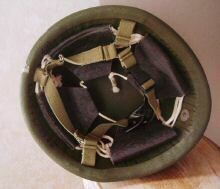 It was approved for usage in the Russian army in 2006. 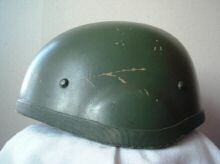 The shell is made of aramid with polymer film binding (different technology than that usually used in western helmets). 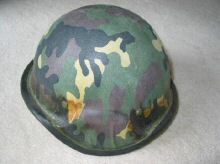 The liner is three-point. 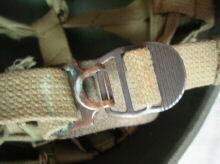 The buckle here is somewhat unpractical being simple hook/ring combination, which could be detached unintentionally." 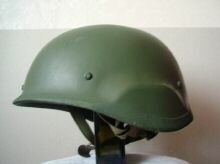 "This is a para helmet in the current NII Stali production line of 6B26/27/28. 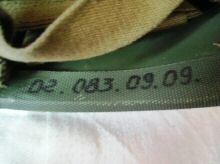 Oficially it is in production since 2006, but at least during first three years they were quite limited in numbers. 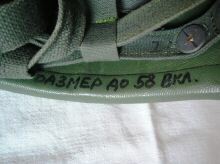 The first units receiving 6B28 were Paras Guards Divisions , like 76th Guards DShD (DShD - Desantno-Shturmovaja Divizija = para assault division) in Pskov. 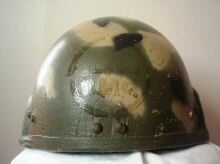 Its shell is clearly less roundly shaped than its 6B26/27 counterparts. 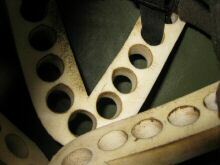 Rivets are also typical for NII Stali products. Due to a different technology, it is lighter (just 1.0 kg) against its Western counterparts. 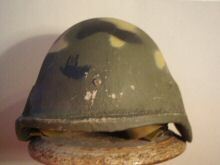 Thickness of the shell is around 8mm against 7mm for 6B26. 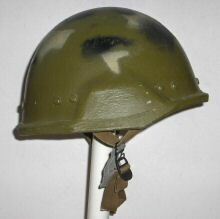 The helmet comes with a cover by default. 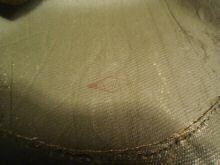 Here it is in Flora pattern. Note the warmer ear flaps. 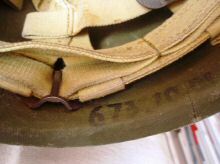 The liner is typical for 6B26/27/28 line - 3-point with a sliding loop at the back. 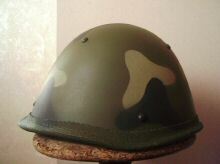 Additionally, cover ear flaps are also fixed underneath the chin, so the helmet sits quite stable." 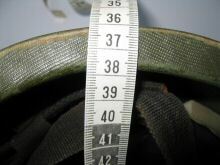 This heavy (2.3kg) composite has a very thick shell and unusual thick "A" shaped foam liner supplements. 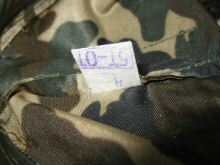 Unfortunately the label on this example is completely worn.